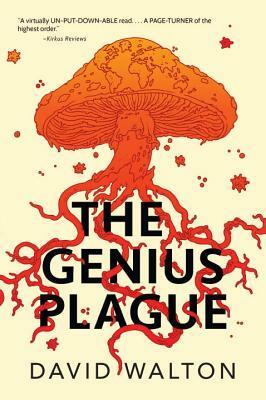 The Genius Plague by David Walton is a highly recommended science fiction/plague novel featuring brothers set against each other and a wide-ranging fungus. Paul Johns, a mycologist, is returning from his trip through the Amazon with a backpack full of fungi samples when terrorists attack the tourist riverboat he is taking back to Manaus, Brazil. When he makes it home to Maryland, he is immediately hospitalized with a life-threatening fungal pneumonia/infection. He recovers but with a gap in his memory. At the same time, Paul is recovering from his infection, but his intelligence has noticeably increased. Neil takes note of the the change in his brother, along with Paul's sudden desire to protect the rain forest. This phenomenon is not just related to Paul, but there are many others who have suffered from the fungal pneumonia and recovered only to exhibit a remarkable increase in intelligence, along with an uncanny ability to seemingly read each other's mind and act in unison. The infected are spreading and so is what seems to be some kind of mind control. The brothers are on the opposites sides of what is becoming an international war. Either the infection represents the next stage of evolution or it signifies the end of the human race. Can humanity survive this biological threat? The Genius Plague is a well written page-turner that will definitely have you staying up too late at night reading just-one-more-chapter. The science is believable, well explained, and Walton makes the case for a fungus to be a plausible threat against the human race. He keeps the action moving at a fast pace in a well-constructed and compelling plot. The brothers are both interesting, well developed characters and their interaction with their father is significant to the plot. There are also a wide variety of interesting supporting characters to keep the plot interesting and moving along. With the thrilling action, Walton adds in a few questions to ponder. What price would you pay for ecological stability? What would you choose if faced with the dichotomy of free will and individuality versus working together in unison for the good of everything? At what cost is mind control acceptable? This is an excellent novel. The only questions I had about it were the unlikeliness of Neil's employment by the NSA with no degree and I'm not entirely happy with the whole ending, but that could be a win because I'm still pondering it too. Disclosure: My review copy was courtesy of Prometheus Books.